The ROSMAP-MP is a compact readout module for multi anode photomultiplier tubes (MaPMT). The module can operate both in spectroscopy mode and timing mode. The mechanical interface is designed to fit the Hamamatsu H8500C and H12700 MaPMTs. Three variants of the ROSMAP-MP are available, namely the ROSMAP-MP-80, the ROSMAP-MP-200 and the ROSMAP-MP-1000, which have dynamic ranges of -80pC, -200pC and -1000pC, respectively. In spectroscopy mode the ROSMAP-MP can read out all 64 channels upon a trigger (68k events/s), or only the triggered channel (200k events/s). The event energy is digitized with 13-bit resolution, and the pulse-height is transmitted along with the timestamp and channel ID. In timing mode, the module detects events up to a rate of up to 1M events/s, and only transmits information about the channel ID and timestamp. The trigger threshold can be set individually for each channel to cope with gain variations of the MaPMT. 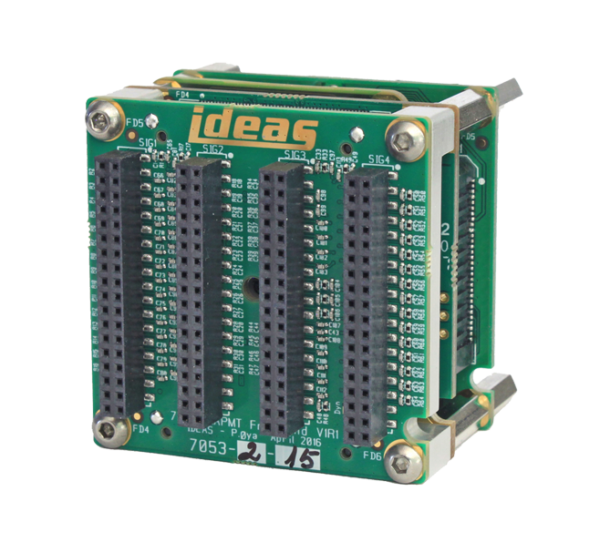 IDEAS Testbench software is delivered with the module to ensure that the user can quickly start operating the ROSMAP-MP. This software allows module configuration, readout in all operating modes, pulse-height and histogram visualization and data logging to file. It also includes a Python interpreter for scripting. An API is also available, enabling creation of custom software solutions. The size of the module is 50 mm x 50 mm, which allows it to fit entirely behind the Hamamatsu MaPMT tube. The module depth is 55 mm, and its mass is 113 g.
The ROSMAP-MP is controlled via an Ethernet interface, and powered by a 5V power supply. It is possible to synchronize several modules via the sync inputs.